You just bought a DV camcorder, but still have lots of older tapes of your kids growing up. Now what? Dazzle's new Hollywood DV-Bridge is just what you need. Using it, you can become part of the digital video revolution. The Dazzle Hollywood DV-Bridge solves the compatibility problems associated with analog and digital video. With this device, connected to either your Windows PC or Macintosh computer, you can digitize and edit the video from your older VHS tapes and mix it with the DV content from your new camcorder. In fact, you can directly transfer video from your new DV camcorder to your older VHS machine directly and vice versa, without using your computer! This is handy when you need to make a copy to show neighbors or relatives that aren't digital yet. 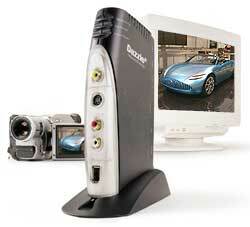 By using a Firewire (i.LINK/1394) interface the Dazzle Hollywood DV-Bridge can transfer the video quickly to your PC. It is compatible with Apple iMovie, iDVD, DVD Pro and Final Cut Pro, Microsoft MovieMaker, Adobe Premiere and others. Dazzle includes their own video editing and authoring software, so you can start right away. Now you can make your own fully edited video tapes, CDs or DVDs. You can even convert the digital video to a streaming format to view on your website or the Dazzle Webcast Theater. You can even send video emails to the relatives overseas. Now your whole family is part of the digital video revolution. Dazzle's Hollywood DV-Bridge retails for $299 and is available nationwide.